Many people do remarkable things in their careers, but few create something that impacts not only the lives of tens of thousands of human beings, but an entire country. Rabbi Joshua Fass ’91YUHS, ’94YC, ’96A, ’98R, the cofounder of Nefesh B’ Nefesh (NBN), has done just that by creating a non-profit organization that makes the dream of making aliyah (immigration to Israel) a reality. By facilitating the often daunting move to a new country with a new language, culture, and government, Rabbi Fass has been privileged to see over 25,000 people make the move to Israel with NBN’s help. Without the organization’s resources, support, and encouragement, a majority of those olim (immigrants to Israel) might not have been able to do so. The benefits to Israel receiving so many committed Jews, embodying Jewish values and, often, great professional success, are endless. “Rabbi Fass’s professional career began after receiving degrees in biology and education from YU and his rabbinic ordination from RIETS. 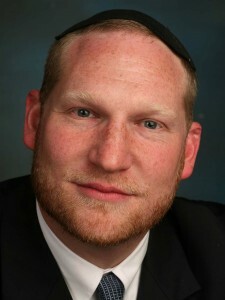 He moved to Boca Raton, Florida, and was the associate rabbi of the Boca Raton Synagogue. He was also the director of the Helen Julius Reiter Institute of Judaic Studies, a member of the Orthodox Rabbinical Council Beit Din, and educational director for March of the Living. Rabbi Fass said that it was the murder of his teenage cousin, Naftali Lanzkron, z”l, in March 2001 by a terrorist bombing in Israel, that prompted his own aliyah. “I felt compelled to stand in his stead and move to Israel together with my family,” explained Rabbi Fass. “When I began to discuss this plan with members of my community, it became clear that there were thousands of other people who wanted to make aliyah but were held back because of certain obstacles. Together with Tony Gelbart, a Florida businessman, we founded Nefesh B’Nefesh, in order to remove those obstacles that were preventing North American Jews from realizing their aliyah dreams and making the idea of moving to Israel a more realistic option.” The first organized charter flight to Israel took place in 2002. In December 2010, NBN assisted the transition to Israel of the 25,000th oleh. Yet those tests are no match for the gratification Rabbi Fass receives from running NBN. “It is extremely rewarding being a part of the realization of a personal and national dream for so many people, while helping build a stronger Israel,” he continued. Yeshiva University has always emphasized a strong love for and commitment to the State of Israel. The Caroline and Joseph S. Gruss Institute of RIETS is in Jerusalem, and under the S. Daniel Abraham Israel Program, students spend a year post-high school in Israel studying at a yeshiva or seminary before continuing their education at one of the undergraduate schools. In 2007, the YU Center for Israel Studies was also established. Many of the olim who have utilized NBN to make aliyah are YU alumni, as are many NBN employees. Adina Schwartz ’86S, ’95BR is the education and community advisor in the pre-aliyah department of NBN. She made aliyah in 1994, also before NBN existed. She stated, “I believe Rabbi Fass has made it normal to make aliyah, when it used to be this wacky thing only a few Bnei Akiva people did. He made it a regular journey for a family to take, and he made it much easier than it used to be. When I first moved to Israel, it was pre-Internet and I had to do all the research myself. I was much less informed about what to expect. With NBN, you have a constant guide and source of information for the move to make the whole thing go smoother and easier.” Ms. Schwartz also pointed out that in the ‘70’s, nearly half of all the people who moved to Israel moved back because they were unprepared to adapt to a new country and a new culture. To connect with Josh Fass, Moshe Heilman, Adina Schwartz and thousands of other YU alumni living in Israel and around the world, visit www.yu.edu/alumnidirectory.